The Atlantic Grille's spectacular, and sweeping, ocean views paired with an elegant South Florida design, make this award-winning oceanfront restaurant the place to be for breakfast, lunch and dinner. With an emphasis on freshly caught seafood and an extensive beverage offering, the Atlantic Grille's new "Shore-to-Table" experience is a must. We are members of the club and we love the view and the food. The service has been excellent lately --before it was poor. The problem we had this past weekend was lack of understanding menus, times and pricing. No advertising ending time of buffet. Easter Brunch! It was wonderful. What a disaster. The hostess couldn’t be bothered by sitting us. In fact, she told us to hold tight while she accepted a personal phone call on her cell phone and stepped outside to take it. We finally seated ourselves at the bar — close to the only people that appeared to be working in the restaurant — the bartenders. 90 minutes after ordering, half of our food came out cold, but we were tired and hungry and just accepted the L for Loss. Not that we’ll be back anytime soon (however we give everyone a second chance), but the manager kindly advised us we could join the locals club for 10% off etc, etc, etc. The views and the service was very good. The food was OK. The price was high for the quality of food. While the website and name say there's a tapas room, don't believe it, it's gone. Disappointed to only learn that after we got there. 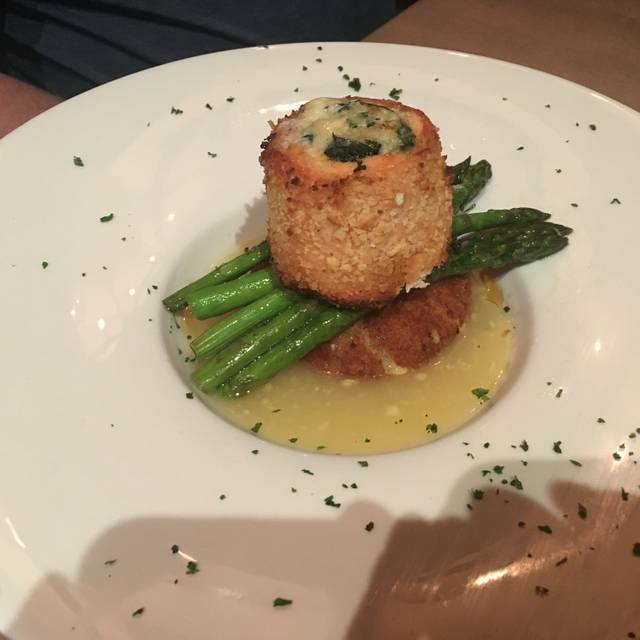 Our dinner experience at Atlantic Grille was somewhat disappointing. Everything from the atmosphere to the service was subpar all for a grand total of $200 for two people. For dinner that costs an average of $100/person one would expect at least one aspect of the meal to be above average. No so at the Hammock Beach Atlantic Grille. The setting, view, service were very good. You can look out to the ocean from just about any table. Also have outside seating. Food was very disappointing. We had brunch, which you can order from the menu or have the buffet. We choose the menu. Eggs Benedict were on the menu as traditional with ham or special with crab. Two of us had traditional, which came out rather cold and the eggs were squares of some kind of scrambled/baked form, not poached as listed on the menu. When questioned, the server said she could provide us with poached at no additional charge. After about five minutes, she brought out one poached egg for each of us on a plate. Others in our party ordered a frittata and gravy & biscuits. Frittata had some pieced of vegetable sprinkled on as a topping, but none inside the egg. The biscuit with the gravy was rather dry and hard, not flakey. Home fries were cold and dry. Mimosa's were a bit weak with no fizz. We did have lunch here the day before and it was very good. She crab soup was very tasty and smooth, not chalky. Salads were very good and the braised short ribs were tender with a flavorful sauce. We would recommend Atlantic Grill for Lunch and the view, but not for breakfast as the chef clearly takes short cuts or they just make up your plates from the buffet. The menu has expanded since the last time I was there and there was much more to choose from. Our waitress was very accommodating and explained some of the drinks. No frozen tropical drinks are available if they need a blender. Was rather surprised at that. The overall experience was good. We did have a problem finding our way from the parking garage. My guests are in their eighties and after many wrong turns and asking several people along the way and climbing many steps we finally arrived. The restaurant wasn't very busy but we waited a long time for our food. One order was brought out five minutes before the rest of the orders. The food was delicious, the service was fantastic however, the food took almost 1 hour to come out. We go for the third time since we moving to Palm Coast 2 month ago. The service still an issue , the food quality maintain mi standard, except this time I do not be impress by the Macaroni Lobster Dish. For the price I still recommend a curving station or a cold cut table . We made a reservation for next week for 5 persons. 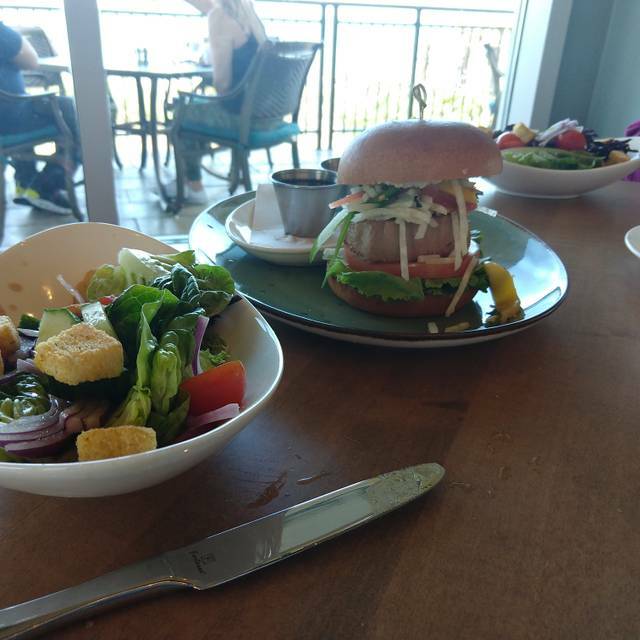 Wonderful food with a view of the ocean. We were visiting Palm Coast and chose this restaurant as our anniversary dinner. We were not disappointed. Enjoyed it so much that we went back 3 days later with friends. Typical country club setting. The bread served prior to the meal is so good we wanted another basket. Dinners enjoyed were filet, salmon and seared scallops and none of the entrees were a disappointment. Their crab bisque is absolutely wonderful. 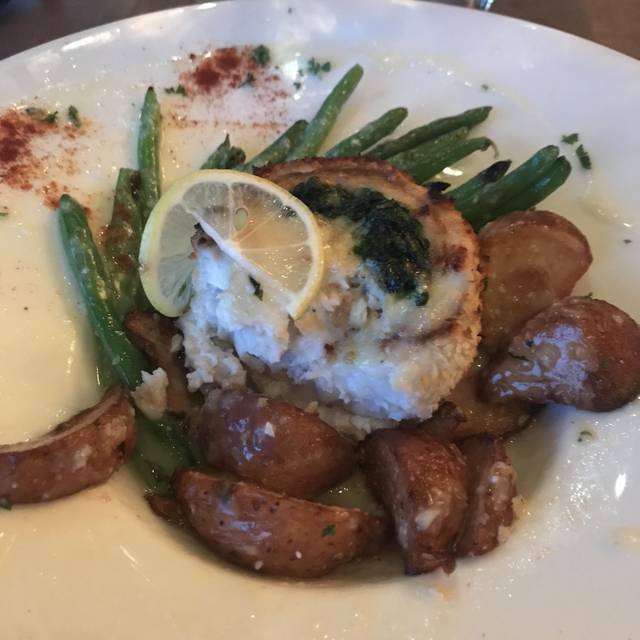 I highly recommend you visit Atlantic Grille and Tapas and also that you make reservations or show up early. Our server told us that by 6:30, the wait would be incredibly long if you do not have reservations. Our dining experience was disappointing at best. We watched several tables seated after us receive water, bread and appetizers prior to us. Our order was incorrect. In fact, all of our dinner party received their meals except the birthday girl. The waiter started to walk away without even acknowledging that she did not have her salad. I would not suggest dining here. Server was very nice. It just took forever to get our food. Excellent food, very attentive service, no better view anywhere! Service extremely slow, 2 dinners seemed like they were kept warm while the other steak was under cooked. Our Server Xavies was exceptional and the food was fabulous. It was our 4th time there and our parents 1st time. We took them to celebrate their 76th birthdays! This is our favorite place to take company, especially ones we want to impress! Great food. Great view. Great staff. Dined twice in one week. NY Strip was amazing. Salmon as well. We enjoyed the view at Atlantic Grille. The food was slow being delivered and the orders were not correct. The main dining room had a party of 16 or so at a long table which made them very loud in that room so we opted for the deck instead. Jose was the server and he did an outstanding job. mi expectation more variety for the Sunday Brunch be appreciate curving station for example. when we be sitting down at the table no one come to us, Nathalie again come to the table to se if some one come, I let her no one come to greeting us she recover the situation very quickly And the server come in to take us from that point . We made another reservation for the Sunday 3/17/2019 with a friend who own and Hotel in the British Virgin Island, we hope to have and outstanding service a that time. Our reservation was made 2 weeks in advance. We reserved a window table. Upon arrival, told the host our name. Then the Host asked what our name was as if she wasn't listening to a word we said. Our table was half view half wall. Not the ocean view we asked for. Had to request to be moved to another table. Considering it was also told upon reservation that it was a birthday, no special attention was made to the fact. Waitress tried to be funny and was actually insulting. No one laughed but her. I can't even say the food was worth going back for, mediocre at best. Will not be returning here. There are far better places in town than this. Very disappointing considering this should be an upscale establishment. Not for the locals. Tourists only. We give it an F. Would not recommend. Have dined at the Atlantic Grille on a few occasions while at Hammock Beach. It was okay - no deficiencies - but also not awesome. Pricey for the experience. We had a reservation and got right in. The restaurant is a lovely, calming shade of aqua that goes with the ocean view. It was too cool to sit outside, but we got a table by the window. Our server was very friendly and prompt. The She Crab Soup was delicious. We also had Seafood Chopped Salad (which wasn't chopped), but it was very tasty. For dessert we split a piece of carrot cake that was divine. The golfers at the next table got a little rowdy, but we still had an excellent time. We will come back for the food and a table on the deck. Service is way too slow. Nice to bring clients here, however when on a time restraint for lunch, this is not the place! Our server Kelly was the best. She made our special day even more memorable. Thank you Kelly!!!!!!! We enjoyed the view at this restaurant however the food was not the best. Caesar salad needed more Caesar dressing chicken was the driest I’ve ever had, Prices were too high for the quality of food. We went to many restaurants in the Palm Coast area over the period of a month and this was by far the worst. Excellent food and service. View is beautiful. There was a wedding party that raised the noise level above our preference, but understand their enthusiasm. Poor service and very long wait for food. We had a reservation. When we arrived, the young hostess was completely lacking in engagement, never really greeting us, distracted looks beyond us, and indifferent. Our server was much better, very friendly and engaged. My wife’s cocktail was delivered in a reasonable time, but I waited for my cocktail for 25 minutes. Supposedly the bar was busy, but yet my wife received her drink. Then I was told they were out of the brand of whiskey I ordered, so I changed to a different brand which was fine, but it was another 10-15 minutes before the drink arrived. For our meals, I’m dairy intolerant so we discussed options with our server for the Catch of the Day… all good. But, when it arrived, it had a white beurre blanc sauce that apparently contained dairy. Our server stopped by to check in, I pointed out the white sauce, and she swooped the plate away to have a new dinner made. To the kitchen's credit they had my new plate out very quickly, and, the yellowtail snapper was superb, but this only added to a clunky dining experience so far. Then the room lights went very bright, like a cafeteria, which killed the otherwise plain decor. I asked our server if she could look in to dimming them back to where they were and she did... thank you. The food was overall good, my fish was great, but the overall experience was not up to what I would expect for a pricier and more "fine dining" restaurant. In the end, they “comp’d” my $37 snapper which I didn’t ask for, but we appreciated them taking the initiative; so they attempted to “make good”, and in this way, they did. Thank you. Our experience was not the relaxing and care-fee dinner out we hoped for and we would be reluctant to go again. We had a petite filet and a rib eye. Very tasty. The risotto was very bland and the asparagus (only 4 little pieces) was also very tasty. Next time, going to the bar for one of their great burgers. This has been my first less then great experience at the Atlantic Grill. The hostess had zero personality and appeared very distracted. She asked me if I was a member of the club which I find annoying. No but I live in Hammock Dunes. The waiter was very nice. The food was really not great. We had 4 fish dishes. All pan seared. It was snapper and maybe trout. In all cases the pan searing resulted in what was more like pan frying and created a thick fried crust on the fish. The trout filets were very thin and a competant chef should understand that they would not stand up to what amounted to frying. The snapper being a bit thicker was better but still below par. My advice is either learn to prolerly pan sear or stick with grilling and blackening. Also dont serve super thin filets. One of our party got chicken which looked good and she liked it. This is a beautiful restaurant but obviously needs some better management. Room was very cold! Our server was very good. Had the specials fish was filleted but seemed a little over cooked. The person who had the salmon thought it was outstanding! Desserts were great. Our reservation was for 630 pm Valentine’s Day. Although the dining room was mostly filled, the table was immediately available for us. Unfortunately, it was already dark preventing our enjoyment of the view.